Productivity boosters! Achieve maximum impact and increase productivity when using Vista Planner Pack with your whiteboard. This pack is an excellent accessory pack for any office. It doesn’t matter if you are planning a week, a month or a year ahead. Get everything you need to change your plain whiteboard instantly. Pre-printed sheets of black on white magnetic numbers, letters, days of the week and calendar months. Also included in the pack is a coloured magnetic sheet of symbols and two rolls of liner tape. Pre-punched for easy separation, easy to read and removable if no longer required. 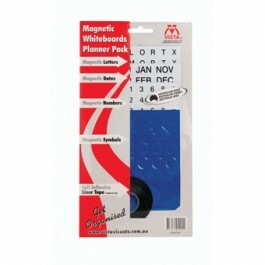 What a great Magnetic Planning Aid. 2 rolls of liner tape; 1.5mm and 3mm.